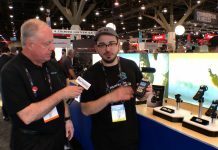 SuperMeet organizers Daniel Berube and Michael Horton are busy pulling together this year’s event at NAB in Las Vegas, but were able to spare some time to tell us what to expect. Not only will there be great speakers like legendary, Oscar Nominated film editor Dylan Tichenor, new-to-the-SuperMeet exhibitors, and the over-$100,000 raffle, but also a whole host of things that they can’t talk about yet. It promises to be a great night, and you can save $5 off a pre-show ticket with the priority code “macvoicevip” at SuperMeet.com. Daniel Bérubé is Co-Producer of the SuperMeet and Founder of the Boston Creative Pro User Group (BOSCPUG), a story driven community of globally connected collaborative digital filmmakers and broadcast professionals focusing on the craft of editing not only to show How but to share Aesthetics and related tools for digital cinema and distribution. When Dan is not working on the SuperMeets or BOSFCPUG, he travels around the country as a camera product specialist for Canon USA, or works as a Producer/Editor with his brother Donald Bérubé at Boston-based collaborative noisy brain Productions. Dan is also an experienced Canon EOS photographer and enjoys capturing magical moments while on the road and transforming images into art on the Mac. Dan can be contacted at [email protected]. Michael Horton is the head and founder of the Los Angeles Creative Pro User Group (lacpug) and Co-producer of the SuperMeet, held annually throughout the world. Follow him on Facebook and Twitter. Save $5 off SuperMeet admission by using the code “macvoicevip” at registration.